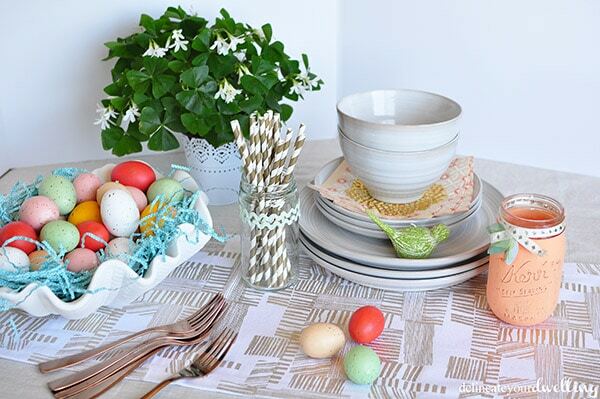 INSIDE : Fun tips on how to set an Easy Spring Table Setting. 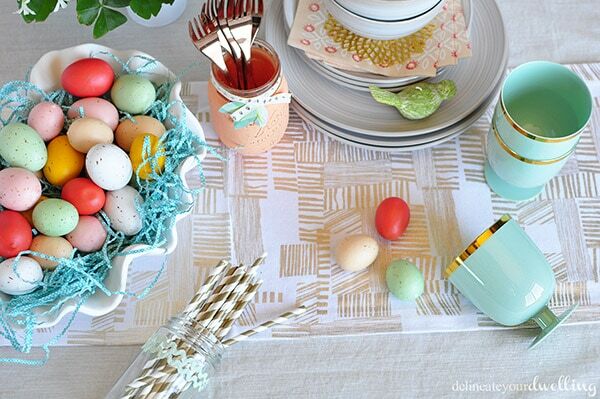 Cheerful color is perfect for having friends and family over for brunch or even a fun Easter Eggs hunt party! Spring is here, friends! Please tell me there isn’t more snow out there for anyone. I think here in NM, we’ve jumped right into summer with 80F days and I couldn’t be happier. When the sun is shining, birds are chirping away and windows are open, there is nothing like having friends and family over to celebrate with a lovely brunch. 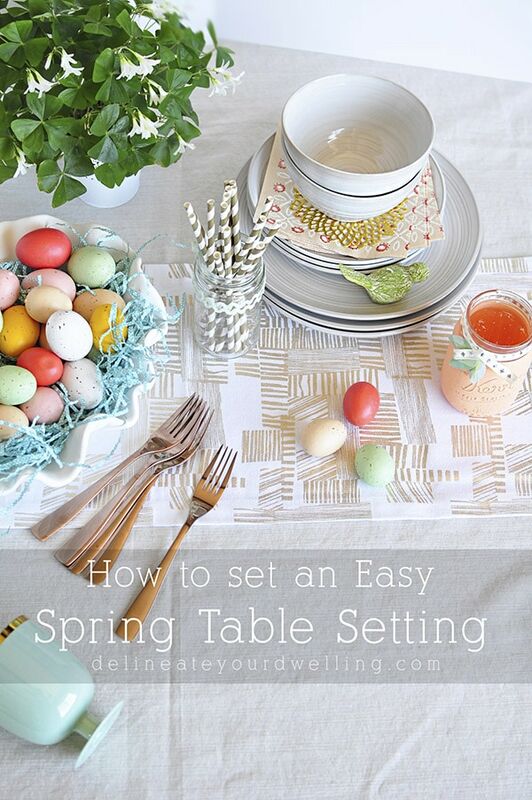 Today I am sharing How to set an Easy Spring Table Setting. I love mixing textures, patterns and colors. It’s the perfect way to set an easy but lovely tablescape. When I am having friends over, I decide on a color scheme and then take a walk around my house to gather small detail pieces to include in my table decor. 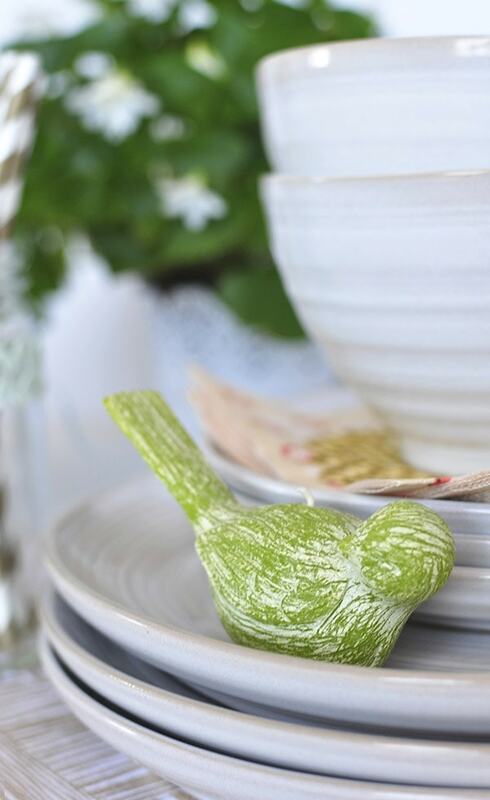 I used this little green bird candle I had sitting on a shelf as a perfect pop of Spring. Last year I made this Mason Jar for a garden party I hosted and it was the perfect thing to hold the flatware this year. 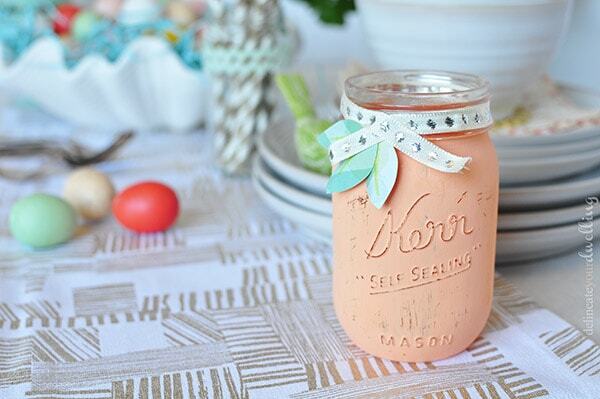 Look how perfectly old jars are for a party! 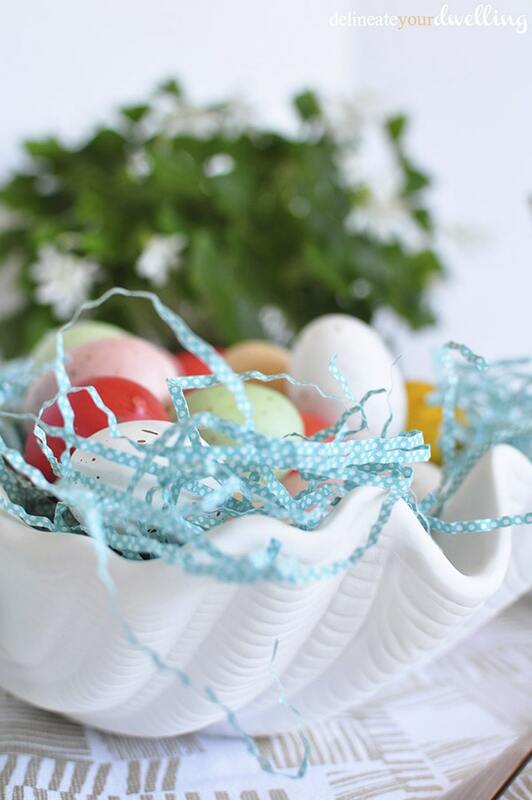 Nothing says spring like these colorful eggs (similar here). And I found the perfect White Ceramic Shell to hold them, which I absolutely love using unexpected items for containers. I love bringing unique details to a space. Varying height is also key to creating a visually pleasing display. And my set of Joy Cho for Target mint cups finally made it to a party! You might have seen on Instagram, that my mommy brain accidentally bought three sets… but aren’t they lovely. Plus, I bought them all on sale…. so 12 cups for $3 is NOT too shabby. 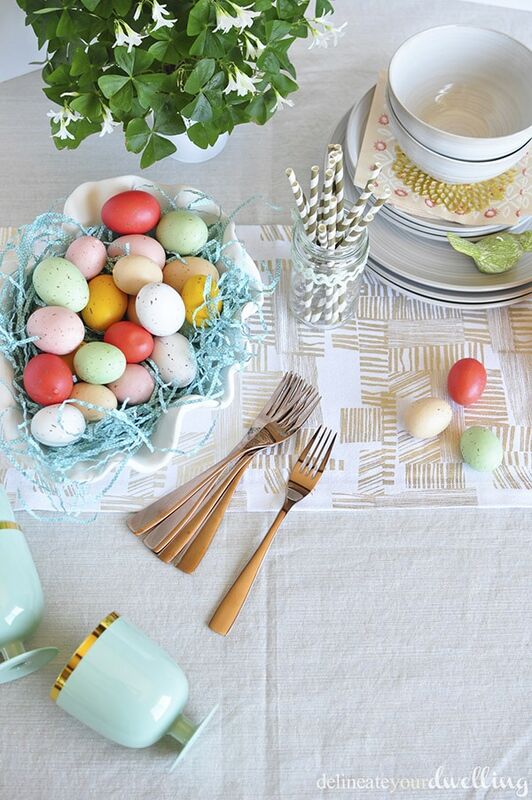 Do you have any Easter or Spring brunch plans this year? 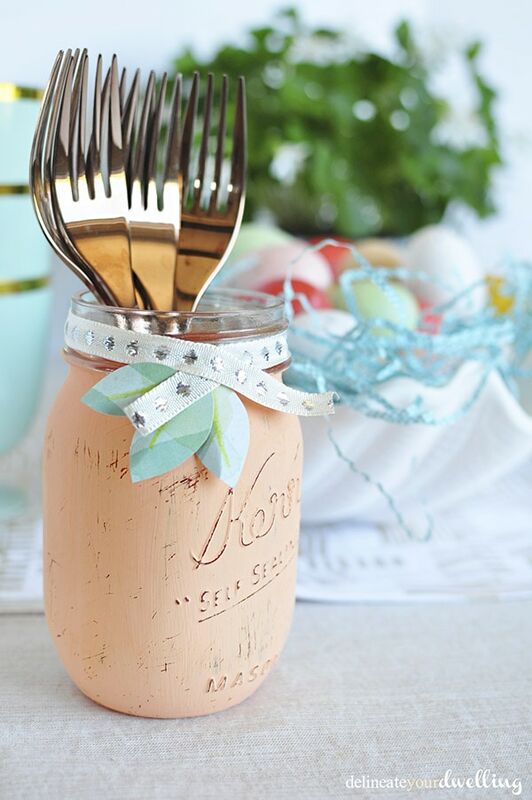 Looking for more fun Easter party ideas? This is so gorgeous. I’ve been feeling resentful toward my super drab kitchen/dining table lately and I think this is just the inspiration I need to finally do something about it. To Ikea I go! I love your color scheme! It’s absolutely stunning and perfect for spring. I have the same mint cups from Target, and got them on sale as well. Thanks so much for sharing. I’m definitely using your post as inspiration for my next get together. Thank you so much, Maria for all the sweet comments! And so happy you have the mint Oh Joy cups, too… love them! This is so pretty! I love all the gold and white. At the beginning of the year, I decided Gold would be my color! Beautiful table! I just stumbled this post. Well, I’m so glad you stumble onto it! I think Gold is my color EVERY year, ha. Thanks for stopping by, Logan. 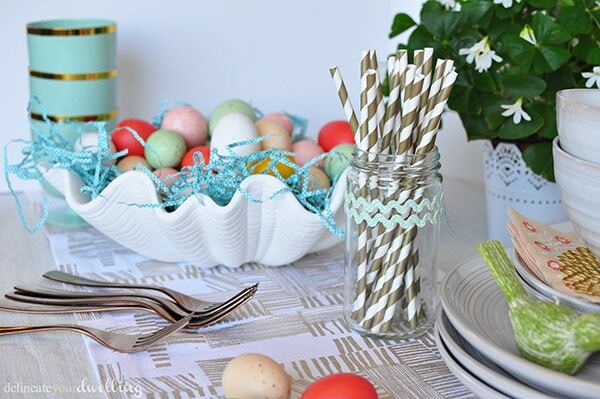 Hi, Amy ~ I love your spring table setting! It’s so colorful and fun. I love shopping my house when I’m getting ready for a holiday or party. I like to find things I haven’t used for a while and incorporate them in unique ways. Thanks for sharing your beautiful spring table! Totally agree, Tiffany! It’s like shopping for free in your own house! =) Thanks for stopping by. I love the beautiful colors…and those Joy Cho mint cups…..oh my goodness! How lovely and inspiring! Still waiting for spring to stay up here. We’ve got snow at the moment, but my husband brought home some fresh tulips to cheer up our table. Oh my, snow still. Well, at least your sweet husband brought your tulips! Thanks, Shelby! Yes, I instantly fell in love with the bright Easter Eggs, too. I love the colors! It’s a great suggestion to go through your house and explore for items that you already have. I’m loving all things spring! Thanks, Lindsay. I love shopping my house, it’s fun to discover how you can mix things together.